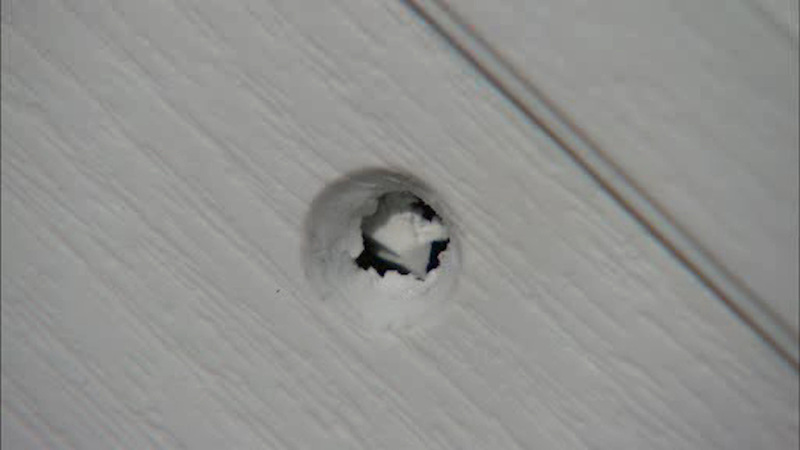 UNION, New Jersey (WABC) -- A woman in Union, New Jersey, is recovering after she was shot by a stray bullet that went through her front door. It happened on Wednesday at 10:57 p.m. on Amherst Avenue. Police officers were responding to the area because of a call for shots fired, when a resident flagged their patrol car down to tell the officers that his mother was bleeding and needed help. The woman in her 50's was shot in the leg and rushed to University Hospital in Newark. Fortunately, her injuries are not life threatening. Police believe the suspects who fired the shots are the same men wanted in a robbery that happened just minutes later on Stecher Place. Two men robbed a resident at gunpoint who was sitting on his front steps of his phone and other possessions. The men got away in a dark SUV that was on Stuyvesant Avenue. The suspects were described as two black men, one thin and one heavy. Detectives investigating these two incidents believe they are related and that the same suspects committed a robbery with shots fired in Linden. If anyone has any information about these crimes, please call the Union Police Department Detective Bureau at 908-851-5030.